Prok & Fitch return to Toolroom Records with the recently released, ‘Man With Soul’, featuring the vocals of Max Linen. Following the success of their 'Toolroom Knights' album at the close of last year and recent BBC Radio 1 support from Steve Angello and NERVO, 2014 may well be Prok & Fitch’s biggest year yet. 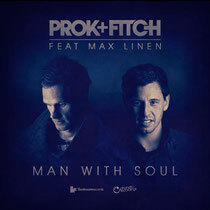 With a US tour planned this month, which sees the duo bring their beats to every corner of the continent, Prok & Fitch, ‘Man With Soul’ focuses on a high-energy, filtered disco groove that relentlessly builds towards a big drop where Max Linen’s vocal takes hold. Heavily featured in Mark Knight’s DJ sets, this is a well-crafted track that should get widespread support from a cross genre of DJs from Miami WMC and right through the Ibiza season. The track is out now, has summer all over it, and should do well for the duo and the label, so check it out below.